Government and the manufacturers’ body have agreed on a series of measures to boost business including the creation of a revolving fund which will allow modernising and retooling of production processes. This was disclosed yesterday in a statement from the Ministry of Finance on the First Inter –Ministerial Round Table with the Guyana Manufacturing and Services Association (GMSA) on Friday at the Ministry of Finance. No details were provided on how the fund would be composed. Several matters relating to the timber industry were discussed and the statement said that the meeting agreed that immediate solutions would focus on steps to address the competitiveness of known and lesser known species of wood, clarifications on investment agreements and greater information sharing, road maintenance in light of heavy dual usage of roads, a review of the applications for VAT, the setting up of a consolidated dimensions stockyard and the establishment of a revolving fund which will allow stakeholders to modernise and retool their production processes and refurbish aging capital stock. Government also committed to revisiting the impact of imported substitutes on the competitiveness and viability of the local market by re-examining existing tariffs and concessions. A follow-up meeting to the first roundtable is scheduled to be held on August 7, to discuss the issues related to the impact of VAT on the sector’s competitiveness. The Inter- Ministerial Round Table will be held three times per year. 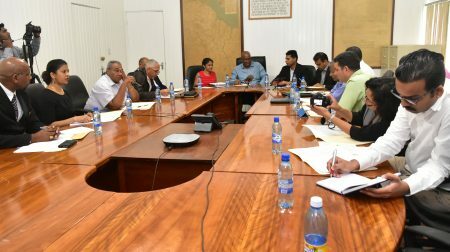 The Round Table was chaired by the Minister of Finance, Winston Jordan and attended by a seven-member team from the GMSA led by President Shyam Nokta; Minister of Natural Resources, Raphael Trotman; Minister of Business, Dominic Gaskin; Minister of Public Infrastructure, David Patterson; Director of Budget, Sonya Roopnauth and Head of Projects, Tarachand Balgobin of the Ministry of Finance and representatives of the Guyana Revenue Authority. The statement said that the GMSA presented a wide range of issues facing the sectors and underlined as most critical, the impact of VAT on manufacturing inputs, equipment and products; the consequences of imported substitutes and the need for supporting mechanisms; the UK Environment Agency Greenheart Restriction; and fiscal supporting mechanisms. The statement added that the Government Ministers expanded the discussion to encompass marketing and quality assurance, integrated land use planning, training and capacity building, forest inventory, ecosystem services, certification and the utilisation of wood waste as part of renewable energy technologies. This statement said that the initiative forms part of Government’s efforts to support the manufacturing and services sectors by engaging the private sector and was born out of a proposal for its formation by the Minister of Finance during his address at the recently held GMSA dinner. The statement noted that the proposal was accepted by the GMSA then sent to Cabinet where it was endorsed, and an Inter-Ministerial team supported by relevant senior technical officers was approved.